As a professional investment casting factory in China, ferritic stainless steel investment casting can be made according to client’s requirements. Ferritic alloys (the AISI 400 series) contain from 10.5 to 27% chromium. In addition, the use of argon-oxygen decarburization and vacuum-induction melting has produced several new ferritic grades including 18Cr-2Mo, 26Cr-1Mo, 29Cr-4Mo, and 29Cr-4Mo-2Ni. Low in carbon content, but generally higher in chromium than the martensitic grades, these steels cannot be hardened by heat treating and are only moderately hardened by cold working. Ferritic stainless steels are magnetic and retain their basic microstructure up to the melting point if sufficient Cr and Mo are present. In the annealed condition, strength of these grades is approximately 50% higher than that of carbon steels. 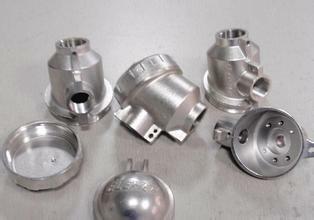 Ferritic stainless steels investment casting is typically used where moderate corrosion resistance is required and where toughness is not a major need. They are also used where chloride stress-corrosion cracking may be a problem because they have high resistance to this type of corrosion failure. In heavy sections, achieving sufficient toughness is difficult with the higher-alloyed ferritic grades. Typical applications include automotive trim and exhaust systems and heat-transfer equipment for the chemical and petrochemical industries.